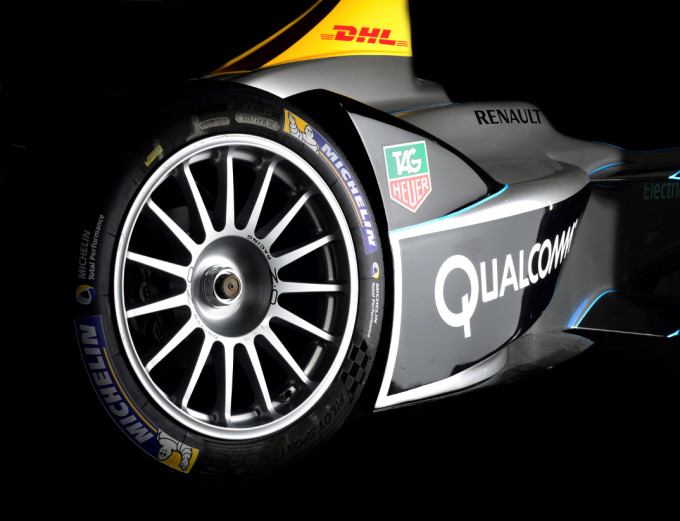 Michelin, the Official Tyre Partner for the FIA Formula E Championship, this week confirmed that Formula E will become the first major single-seater series to run on all-weather tyres. All of the fully-electric Spark-Renault SRT_01E cars will be fitted with 18-inch treaded tyres capable of providing optimum performance in both wet and dry conditions (so no separate slick and wet tyres), helping to reduce overall costs and promote sustainability. What’s more, for each event drivers will have just three sets of tyres for both their cars to cover free practice, qualifying and the race – equating to a set and a half per car – eliminating excess use and also the need for teams to invest in costly tyre-changing equipment. Alejandro Agag, CEO of Championship promoters Formula E Holdings, added: “The decision to use all-weather tyres is in line with the whole philosophy of the Championship. Less rubber equals less consumption. Michelin was very clear that was the line they wanted to take, and that was the same line we wanted to take, so it was all very easy."